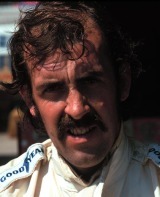 David Hobbs achieved five top-ten finishes in a six-race career spread over eight seasons, but it was away from Formula One that he achieved his greatest successes. An impressive racing CV included winning the US Formula 5000 championship in 1971 and the Trans-Am Series title in 1983, 20 appearances in the Le Mans 24 hour race as well as outings in the Indianapolis 500. In latter stages of his career he began to commentate on TV and he combined this with running a car dealership in the Wisconsin. He was inducted into the Motorsports Hall of Fame of America in 2009.